Giorgio Armani introduces for spring 2017 the new Power Fabric Foundation. This is a brand new liquid foundation which offers SPF 25 and high coverage with a lightweight feel and natural finish that is suppose to feel like your second skin. I’ve rarely been in need of using a high coverage foundation but I surely like Giorgio Armani’s products, Luminous Silk Foundation (review, photos) being a favorite of mine. So I’m really curious how comfortable this new longwear high cover foundation will really feel. The foundation will be available in a range of 12 shades, packed in a 30 ml bottle with a pump and black cap. This foundation was designed as a multitasking product as well, not only helping you cover discoloration and conceal blemishes but also to even out the color of your complexion and provide a smooth, radiant finish. It can be used all over face as a regular foundation or as a concealer, only applied on certain areas where you feel you need to correct or hide skin imperfections. The formula is easily buildable so you can use a brush or just your fingertips . 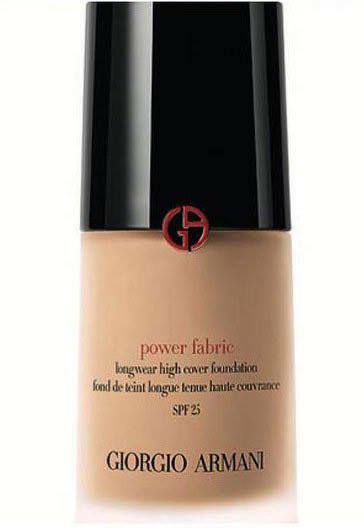 I’m sure many of you will have this product in their hands before I’ll get the chance to try it out, so if you do please let me know what do you think of the new Power Fabric Foundation.